We are so pleased that the JBS television providers listed below support the important and cultural programming found on JBS. If your television provider is not listed, your television provider still does not carry JBS as part of their channel lineup. We remain in conversation with every television provider that does not currently carry JBS and continue to offer JBS to them free of charge. It is bewildering to us that any provider would not want to provide its customers with the only channel on American television with the unique programming available on JBS every week – especially because JBS is the only channel on American television which televises Live Friday Night and Holiday services and because there are tens of thousands of Christian customers who care deeply about Israel and have a profound interest in understanding Jewish life. We ask you to continue to make your desire for JBS known to your television provider and we hope to have good news for many of you in the very near future. 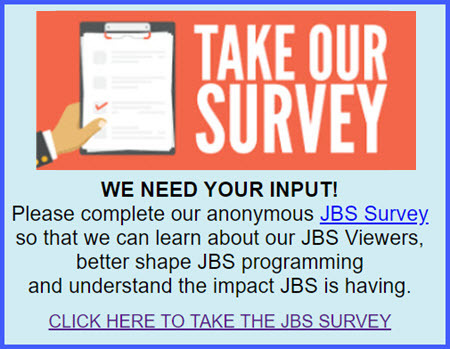 You can also send an email to JBS at mail@jbstv.org with your name, address and the name of your television provider and we will pass on your request to your provider. If you care about Israel and are committed to the future of the Jewish People, it is important for you and those you know to be able to watch a Jewish channel devoted to the State of Israel and celebrating all things Jewish. Watch the JBS Channel by going to the ROKU Channel Store and then select Genre-Educational and then select JBS. Add JBS to your favorites.